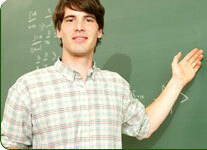 To graph a quadratic function, first calculate several ordered pairs. Then, plot the corresponding points on a Cartesian coordinate system. Finally, connect the points with a smooth line. Make a table of five ordered pairs that satisfy the function f(x) = x2. Then, use the table to graph the function. To make a table, select 5 values for x. We will let x = -2, -1, 0, 1, and 2. Substitute those values of x into the function and simplify. Now, plot the points and connect them with a smooth curve. 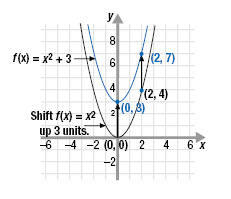 The graph of a quadratic function, f(x) = Ax2 + Bx + C, has a distinctive shape called a parabola. The sign of the coefficient of x2, A, determines whether the graph opens up or down. â€¢ When A is positive, the parabola opens up. â€¢ When A is negative, the parabola opens down. Graph the functions and state the domain and range of each. For each input value x, the output of f(x) = x2 + 3 is 3 more than the output of f(x) = x2. Thus, the graphs have the same shape, but the graph of f(x) = x2 + 3 is shifted up 3 units. Domain Since we can square any real number, the domain is all real numbers or (-∞, +∞). Range We can see from the graph that the smallest value of y is 3. Therefore, the range is y ≥ 3 or [3, +∞). 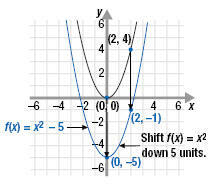 b. Graph To graph f(x) = x2 - 5, we note that for each input value x, the output of f(x) = x2 - 5 is 5 less than the output of f(x) = x2. Thus, the graph is shifted down 5 units. Range We can see from the graph that the smallest value of y is -5. Therefore, the range is y ≥ -5 or [-5, +∞).